An afternoon session at ASH today focused on the proteasome inhibitor class of drugs currently available drugs like Kyprolis and Ninlaro in newly diagnosed or relapsed patients as well as those with smoldering myeloma. Also, a new oral proteasome inhibitor, oprozomib, is on the horizon. Dr. Pieter Sonneveld and colleagues from the Netherlands investigated the combination of Kyprolis + Pomalyst + dexamethasone (KPD) in patients who are refractory to Velcade and Revlimid. In this trial, 60 patients received the KPD combination and 87% of patients achieved a partial response or better with 31% achieving a complete response (ABSTRACT 801 https://ash.confex.com/ash/2018/webprogram/Paper114029.html). Another presentation focused on the use of proteasome inhibitors in patients with smoldering multiple myeloma (SMM). 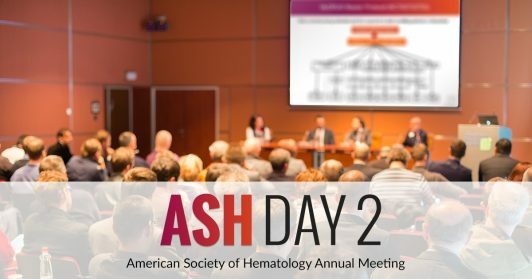 In a phase 2 study by Dr. Mark Bustoros of the Dana-Farber Cancer Institute, he investigated the use of Ninlaro + Revlimid + dexamethasone in 29 patients with high-risk SMM (ie, those patients at risk for developing active myeloma) (ABSTRACT 804 https://ash.confex.com/ash/2018/webprogram/Paper117871.html). Dr. Bustoros showed that 93% of patients achieved a partial response or better (56% achieving a very good partial response or better) with treatment and none of the patients have progressed to active myeloma. As noted in our discussion of our MMRC trial of Empliciti + Revlimid + dexamethasone for high-risk SMM patients (presented on Saturday, ABSTRACT 154 https://ash.confex.com/ash/2018/webprogram/Paper117914.html), the benefit of SMM treatment must outweigh the potential risks. SMM patients may live without symptoms for quite some time, and all treatment regimens have side effects associated with them. A new proteasome inhibitor under investigation is oprozomib. A phase 1 study was conducted by Dr. Parameswaran Hari of the Medical College of Wisconsin that combined oprozomib + dexamethasone (Odex) and oprozomib + Pomalyst + dexamethasone (OPomD) for treatment of 34 relapsed myeloma patients (ABSTRACT 803 https://ash.confex.com/ash/2018/webprogram/Paper112610.html). Results showed that 67% of patients responded to the OPomD combination. The main side effects were gastrointestinal (such as nausea, vomiting, diarrhea).